A good manicure or pedicure is surely one of life’s greatest little pleasures. A pop of color on perfectly-painted digits is an easy way to add some personality to even the most drab outfit. Well-groomed nails make you look infinitely more polished (pun intended). 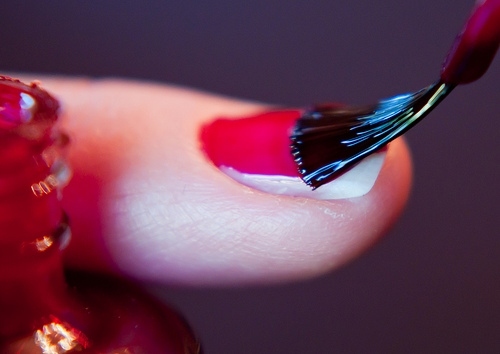 The only problem with a manicure or pedicure is that traditional nail polishes contain some pretty harsh chemicals. Many polishes list ingredients like formaldehyde (a preservative), camphor, parabens, dibutyl phthalate (DBT–added to prevent chipping) and toluene. Although it’s hard to say what amounts of these chemicals you’d have to be exposed to in order to experience adverse effects, recent studies have shown a correlation between some polish chemicals and cancer in lab animals. Others have linked these chemicals to chemical pnuemonia and birth defects. Scary stuff! But never fear! Many companies have started to develop safer, more natural polishes that are easily accessible, reasonably priced & of course, available in an array of stunning colors! Below, I’ve compiled a list of five eco-friendly nail polish companies worth checking out. This family-owned company originally marketed their products to mothers-to-be, because they are safe for mothers to wear during and after pregnancy. But regardless of who they were originally intended for, these water-based, nontoxic polishes come in 14 adorable colors suitable for anyone. And although I’m not hopping a train to Baby Town anytime soon, polish names like “There’s No Place Like Home” and “Unconditional” still make me feel fuzzy inside. Where to Buy: For a list of Polished Mama retailers and e-tailers, check out this page on their official site. 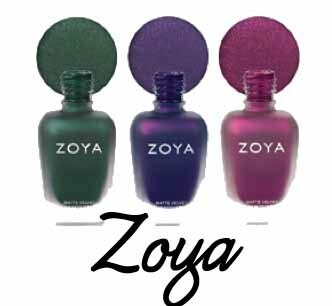 If you’re looking for a wider variety of colors–or more than just polish–Zoya products should be at the top of your shopping list. Zoya’s products are all toluene, formaldehyde, DBP (phthalates) and camphor-free. Not to mention, they’re also vegan-friendly! Zoya boasts more than 300 polish colors, not including 4 seasonal collections, polish remover, base coats, speed drying drops and polish thinner, among other products. Need more convincing? An individual panel for Women’s Health Magazine voted Zoya the longest-lasting natural nail polish. 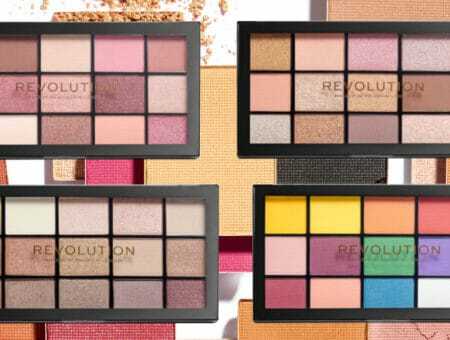 Where to Buy: Bottles are available directly through the company’s website, by calling 1-800-659-6909, or searching the company’s US and international salon locator. And if you need help? Zoya offers round-the-clock customer service, with a REAL, LIVE, SPEAKING person. Shocker, right? 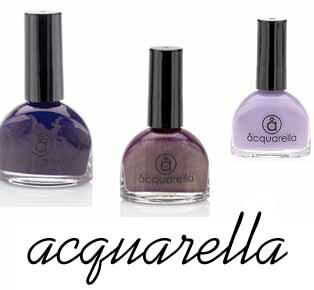 Acquarella nail polishes live up to their name:They’re non-toxic, non-flammable, free from toxic fumes and made from the earth’s most important natural resource–water! The polishes come in 25 varying shades, including cremes, translucents, metallics and shimmers. My pick? “Vamp,” an opaque royal purple. There’s also a helpful How-to guide on the company’s site with step-by-step instructions for using the polishes to get the best results. When it comes to overall eco-friendliness, Priti definitely out-greens the competition. They have over 100 different polishes, all non-toxic and made from USDA certified organic ingredients (including a biodegradable soy polish remover!). Not only that, but all Priti’s promotional materials are printed on 100% recycled paper–and their nail polishes are recyclable, too! Where to Buy: You can purchase the polishes on Priti’s website. As a bonus, the site is hosted by ThinkHost, a web host entirely powered by wind & solar energy. So cool! If you’re looking for a brand that’s wallet-friendly as well as eco-friendly, you’ll definitely want to check out Kaia House. Their organic polishes come in a parade of vibrant shades and are each named after famous cities, from San Francisco to Shanghai. Plus, if you’re into more than just polishes, Kaia House offers a whole line of eco-friendly beauty products that have received rave reviews. 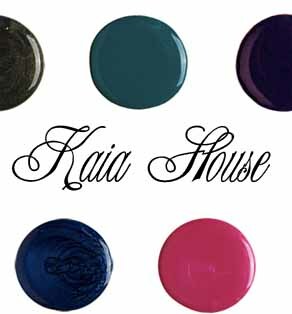 Where to Buy: Products are available to purchase from Kaia House’s website, and retail for $8 a pop. 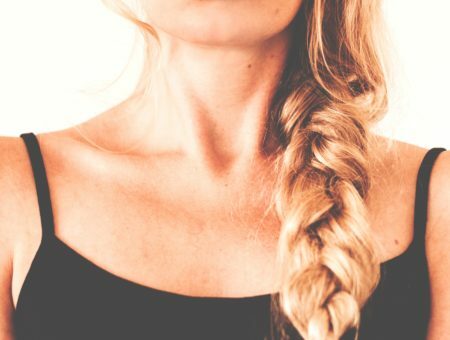 Eco-friendly beauty products are definitely an emerging trend, and I want to know what you think. Have you tried any of these polishes? Would you try an eco-friendly polish? Love (or loathe) any other eco-friendly nail polishes I didn’t mention? Let’s share our eco-friendly beauty stories/experiences in the comments!